Sanjay Dutt biopic is one of the eagerly awaited films of 2018 and the man himself recently had the opportunity to watch the flick. Buzz is that Sanju had a sneak-peek of a few edited rushes of the untitled project and is mighty pleased with his friend Rajkumar Hirani’s directorial and Ranbir Kapoor’s portrayal of Baba. The film is rumored to be titled ‘Baba’, as Dutt is fondly known and will feature stars like Sonam Kapoor, Anushka Sharma, Dia Mirza, Manisha Koirala and Paresh Rawal. After much delay, Dutt’s biopic will finally hit the screens on June 29. 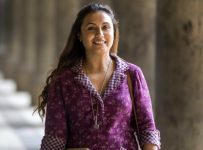 Rani Mukerji’s directorial debut in 2020?